You might not have the fondest childhood memories of meatloaf, but winter is the perfect time to revisit the loaf. It’s a perfect vehicle for packing in tons of protein, iron and other nutrients into a handy, sliceable main dish. The recipes are often pretty forgiving, they’re easily made vegan or gluten-free, and they freeze well, meaning you have hearty re-heatable leftovers for days. So pull up a plate of mashed potatoes, settle in and enjoy these savory, comforting meatless veggie loaves. Miss Mom's (or Dad's) classic, comforting meatloaf? This chickpea version from Connoisseurus Veg will hit the spot. These mini-loaves are perfect for a wintertime appetizer, or when you're planning meals ahead and want to freeze some for later. Lentils and walnuts give this loaf from Modern Day Missus its savory flavor *and* tons of iron. Roasting the veggies in Veganosity's loaf gets everything nice and caramelized. If you're getting bored with quinoa, try baking it into this protein-packed loaf from The Lovin' Forkful! An easy mango salsa adds a pop of color and flavor to Making Thyme for Health's black bean loaf. Flax eggs keep this vegan nut loaf from Veganosity nice and moist in the oven. Sauteed mushrooms, leeks and garlic make this loaf from Avocado a Day Nutrition extra savory. Top Pumpkin and Peanut Butter's vegan and gluten-free loaf with a generous helping of classic ketchup glaze. Lentils and veggies get the (homemade) barbecue treatment in That Girl Shannon's vegetarian loaf. The leftovers of this vegan lentil loaf from The Muffin Myth can be tossed in the freezer for busy days! I love all these! Veggie “meatloaf” is the perfect easy meal because you just mix a bunch of stuff, bake it, and then you have a ton of leftovers! 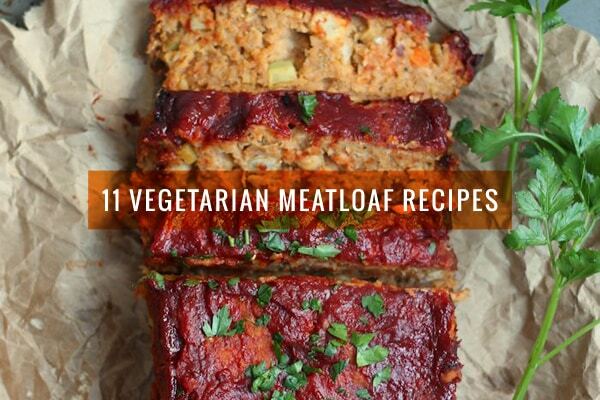 Ooooh I love a good meatless loaf, great round up!! Veggie meatloaf freaks my husband out, but I LOVE it! Thanks for a great roundup of recipes. Oh my gosh this look so good! I need to try this! veggies loaves are always on point! i love them so much. made cauliflower chickpea with cashew loaf yesterday, and it was so so good. thanks for inspiring me to cook with those lovely recipes! We’re working on fixing the issue. They should be up shortly! Sorry about that!